"a bed & breakfast inn"
If you want a small, intimate bed and breakfast comfortably furnished with family quilts and antiques, walking distance from the River Walk in historic King William, you don't have to look any further. The Brackenridge House is the answer to your needs. It will remind you of your grandmother's house, only better. You don't have to make your own bed or clean your plate or clear the table. Your room will have its own private bath, coffee maker, mini-refrigerator with complimentary beverages, cable t.v. and telephone. Relax on a breezy veranda or in the garden hot tub or use your free trolley passes to explore the wonderful sights and sounds of downtown San Antonio. Native Texan owners and innkeepers, Bennie and Sue Blansett will welcome you and see to your every need. Located only one-half mile south of the Alamo in King William Historic District, the Brackenridge House is just two blocks from the river, six blocks from downtown and one block from the downtown trolley stop. 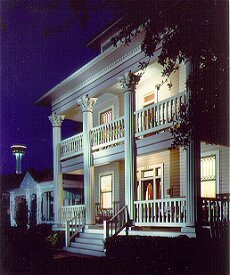 Brackenridge House "a bed and breakfast inn"